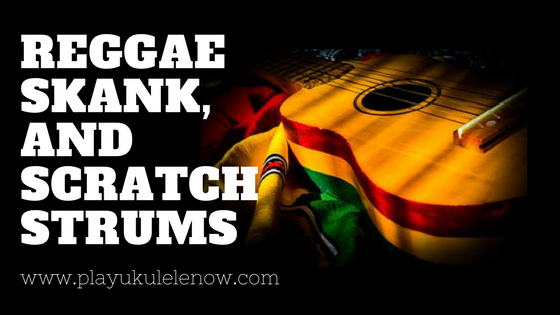 Rest the side of the palm of your hand on the strings, right next to the bridge, with your thumb pointing outward, away from the ukulele. Make sure that you hand is muting the strings as it rests on them. 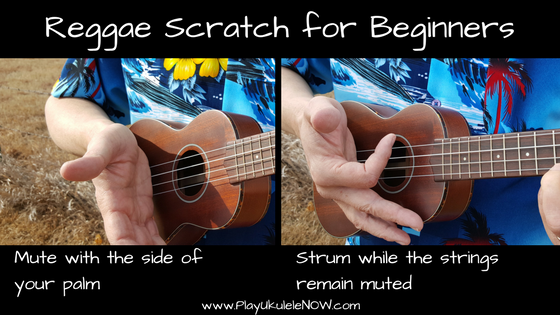 Use your first finger to strum as indicated below as you continue to mute the strings. You'll get a scratching sound. Now count: 1, 2 and, 3, 4 and, notice you'll add an "and" after the 2nd and the 4th beat. Play on these beats: 1, D U, 3, D U. 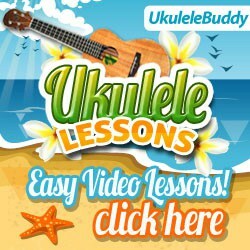 You will be playing a Downward strum on the "2" and an Upward strum on the "and" same thing on the "4 and"
Not sure about the notes and strumming or want to learn more, see the Play Ukulele NOW Method and Songbook for comprehensive lessons on strumming or the FREE eBook for the basics. This is just a double time version, ( meaning it's twice as fast), of the Reggae Scratch. The rhythm above uses 8th notes, since the Skank strum is twice as fast you'll need to use 16th notes! For 16th notes there will be quite a few counts in between the 1, 2, 3 and 4 counts. For 8th notes you count: 1 & 2 & 3 & 4 &; in strumming eighth notes you'll have a strum on each count and on the &'s in between. After tapping your foot and counting, play a downward strum on the "&" and an upward strum on the "a." Like this 1 e D U 2 e D U 3 e D U 4 e D U, you should still be tapping your foot along to keep time, as indicated above. 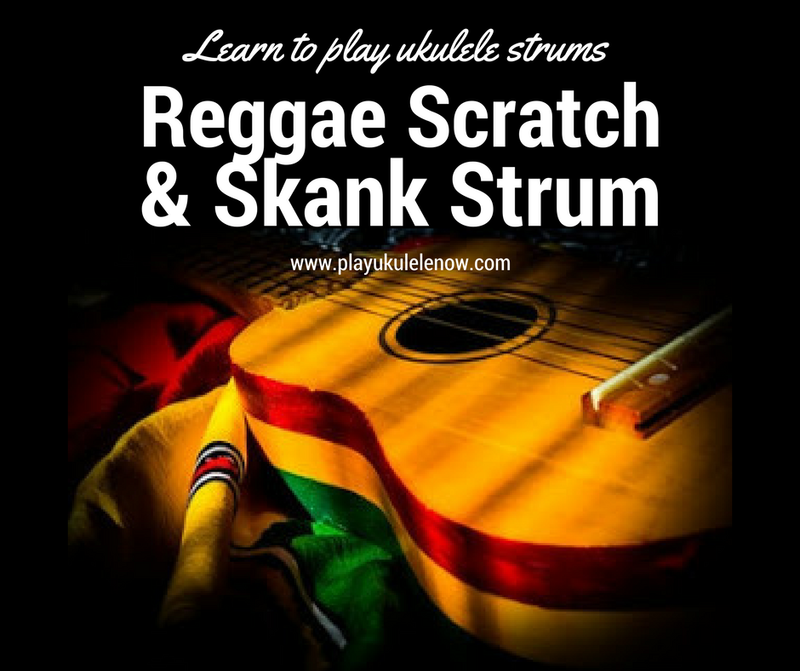 For advanced players: These strums are common in modern Reggae music, but can be used for almost any song. 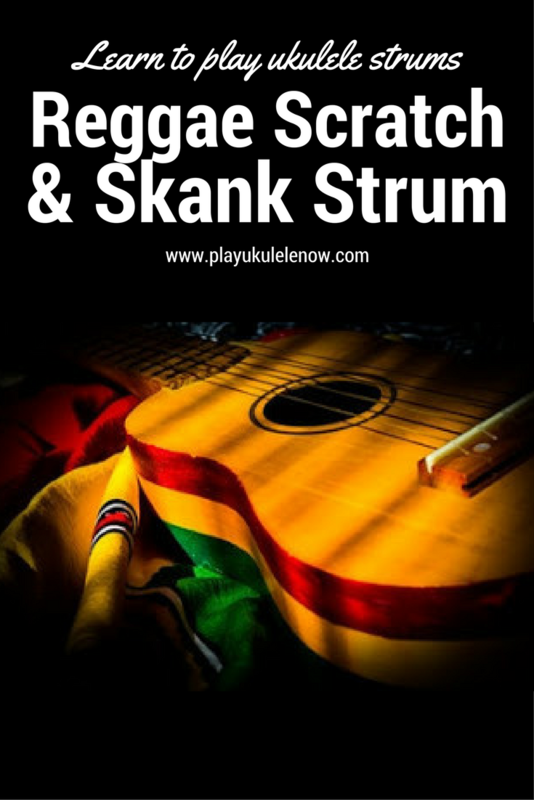 These strums can also be combined with regular chord playing for a real complex and interesting sound.